Carlsson faces Agrest in televised "Power Tourney"
In the aftermath of the media blitz created by the Kasparov-X3D match, chess has gained worldwide exposure and many other nations are also testing the waters. ChessBase.com reports on the "Power Chess Tournament" pitting the Nordic and Swedish Champion, GM Evgenij Agrest, and two-time champion of Tusenmannaschacket, the world's largest rapid chess tournament, Pontus Carlsson, also of Sweden. This experiment will attempt to market chess to the Nordic countries (Sweden, Finland, Norway and Denmark) in hopes that Nordic media giant, Viasat Sports will run a series of future telecasts on chess. The game aired on yesterday Thursday, December 4th and will also air today Friday, December 5th on the Swedish network. In a tough battle, Agrest edged Carlsson with the game ending in mate. The link is given below. GM Evgenij Agrest set to face off against NM Pontus Carlsson. 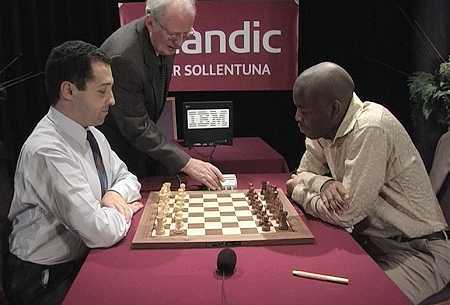 The two will take part in a televised rapid match called the "Power Chess Tournament." Carlsson (right) is considered deadly in fast time controls. Photo by Jonas Eriksson.